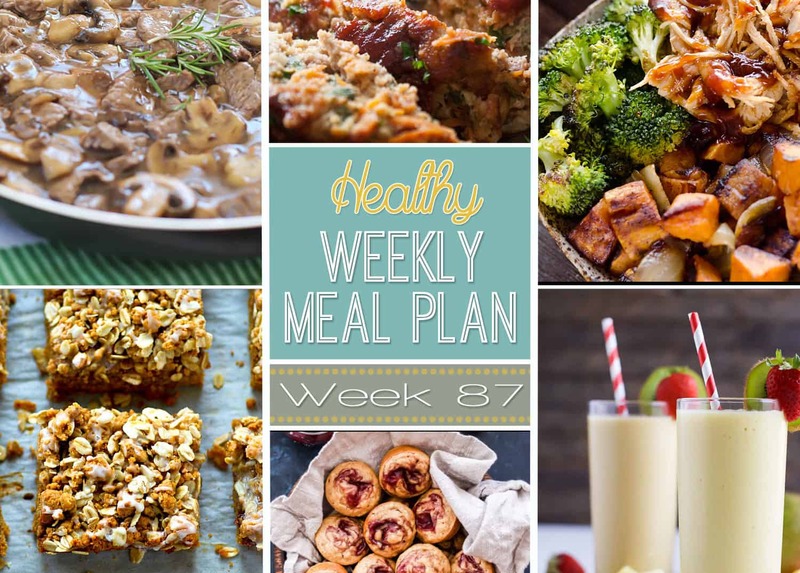 A delicious mix of healthy entrees, snacks and sides make up this Healthy Weekly Meal Plan #87 for an easy week of nutritious meals your family will love! I have been back from vacation for over a week now, but I am struggling to not still eat like I am! It is really time for me to hunker down and get it together. Some of the meals this week will make that exceptionally easy. From BBQ Chicken & Sweet Potato Bowls to yummy smoothies, there are lots of healthy recipe options to keep me satisfied. 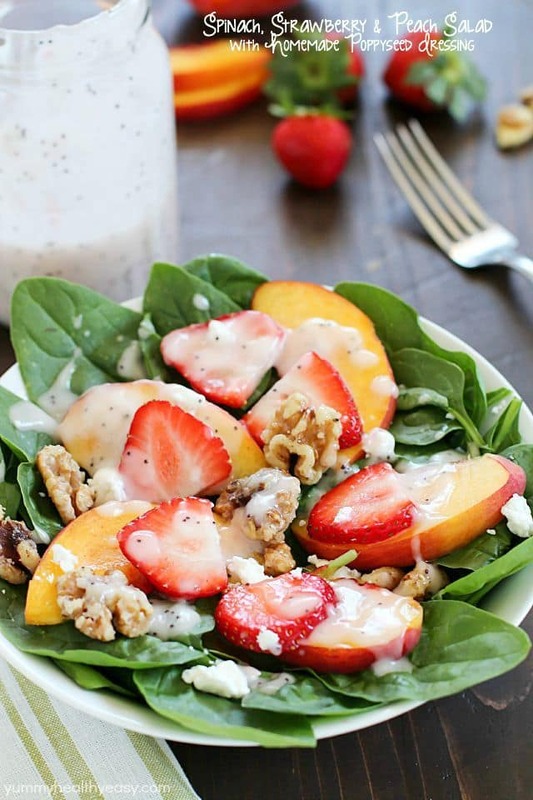 I am particularly excited for the Spinach Salad with the fresh spring flavors! Stop back every Saturday for your weekly fix of daily entrees as well as a breakfast, lunch, snack and dessert! Just click on the photo or link to see the recipe. For even more healthy meal inspiration, check out our Healthy Weekly Meal Plan Archives HERE! If you are looking for a great tool to organize your weekly meal plans, download this Free Printable Meal Planner + Calendar or check out this meal planner book. This Creamy Mushroom and Spinach Pasta is an easy, but elegant vegetarian pasta dish. Hearty mushrooms and whole wheat pasta make it a filling dinner without any meat! 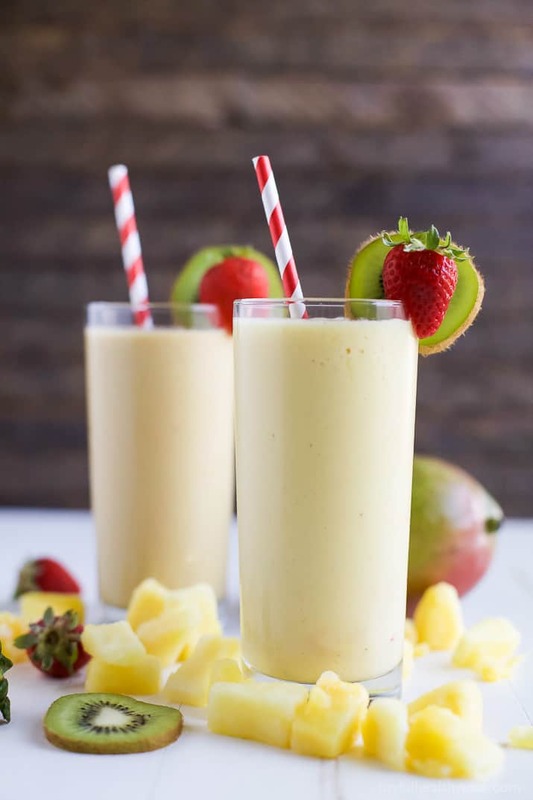 This refreshing Tropical Mango Smoothie is the perfect way to start your day. Fresh flavors that will take you straight to the beach and with 21 grams of protein! BBQ Chicken & Roasted Sweet Potato Bowls are a hearty and healthy dinner idea bursting with bold flavors and nutritious vegetables. This easy sheet pan recipe is perfect for meal prepping lunches for work or a quick weeknight meal. Seafood and Potato Stew is a hearty and comforting weeknight dinner that will keep your entire family cozy and full! 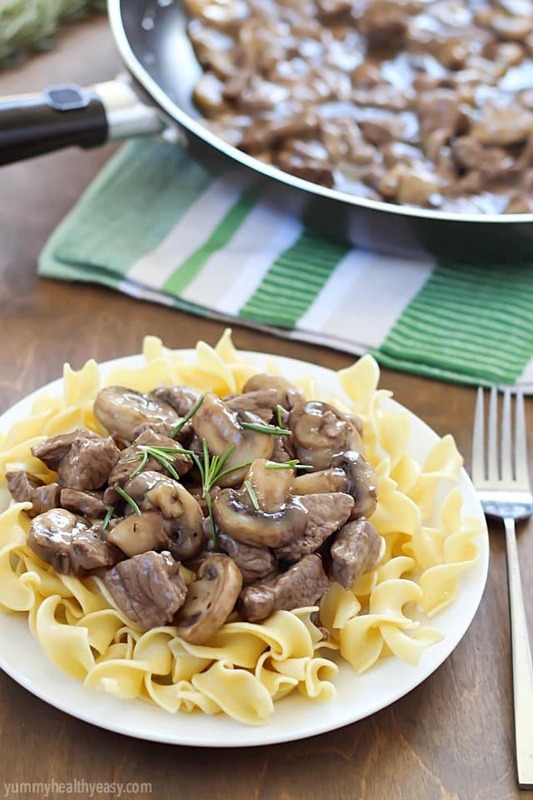 Quick & Easy Beef and Mushrooms recipe, cooked in one pan and in 15 minutes! Perfect dinner for a busy night, using only 3 ingredients. Light Turkey Noodle Casserole is a hearty and healthy dinner idea the whole family will love! All of the traditional flavors of noodle casserole are lightened up with whole wheat spaghetti, zucchini noodles and Jennie-O lean ground turkey. These Raspberry Jam Swirled Almond Butter Muffins are perfect for breakfast, brunch or an afternoon snack. 100% whole wheat, vegan and absolutely delicious, it’s hard to only eat one! Classic Turkey Meatloaf that the entire family will go crazy for! Insanely moist and so packed full of flavors! 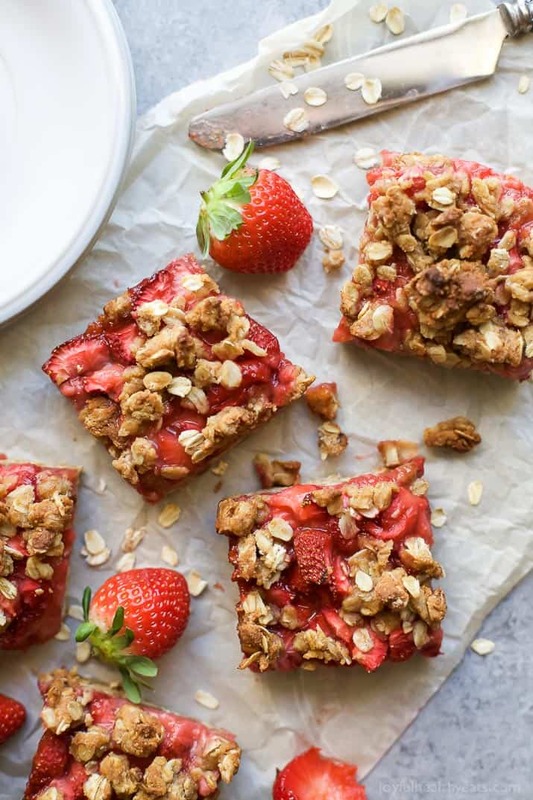 Healthy Strawberry Oatmeal Bars filled with juicy strawberries and a buttery crumble topping for only 132 calories a serving! Serve it for breakfast, dessert, or eat it as a snack! These loaded Cookie Bars are a peanut butter and jelly lover’s dream! An oatmeal streusel topping and tons of glaze drizzled on top make them so fun and kid-friendly. Loaded with spicy chicken and beans, tons of hot rice, and all the salad bowl ‘fixins, these flavorful weeknight Rice Salad Bowls are the EASIEST way to get everyone to eat their salad! Don’t forget to subscribe to my newsletter HERE so you never miss a meal plan! Use this Free Printable Weekly Meal Planner to organize your menu and grocery list. Take the guess work out of preparing weeknight dinners and grocery shopping trips with this easy planner.